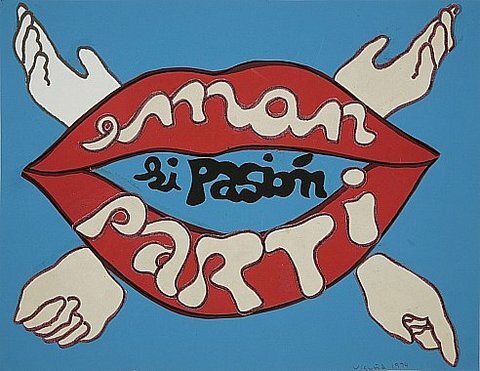 To commemorate the 40th anniversary of the coup in Chile and the acquisition of palabrarma (1974) and eman si pasión/ parti si passion (1974), by the Chilean Cecilia Vicuña, the University of Essex dedicated Latin American Week to Chile. Titled Chile 1973-2013: Memory, Accountability and Reparation and organized by ESCALA and the University of Essex’s Center for Latin American and Caribbean Studies (CLACS), the program comprised a number of activities mainly focusing on talks. Pablo Larraín’s film No, Patricio Guzmán’s documentary La Nostalgia de la Luz were also featured, in addition to a recorded welcoming message from Chile’s former President Michelle Bachelet. After having held the first Latin American Week in 1990, the University of Essex decided to revive the initiative in view of its interest in the region and to provide a context for its additions newest acquisitions to its Latin American collection, in this case with two drawings acquired at the Pinta Fair from London’s England & Co. gallery, with the help of the Museum Acquisitions Program. "We’d been familiar with Cecilia’s work for several years through the research undertaken by ESCALA’s professors and co-founders Valerie Fraser and Dawn Ades, of the School of Philosophy and Art History" said Joanne Harwood, the director of ESCALA (Essex Collection of Art from Latin America). Valerie Fraser and Dawn Ades took part in the talks, as did Todd Landman, Gladis García Soza, María Elena Heed, Nelson Fernández, and the Chilean curator residing in London, Cecilia Brunson, among others. Although the show was a "mini exhibition" as ESCALA officially stated, it was a consistent starting point for reflecting on Chilean art during the past 40 years and on the social reality in Chile in its quest to recover democracy. Cecilia Vicuña has not only spoken out against the dictatorship, but has also explored facets of human life through her poetry and artwork, which is related to rites and words. In Joanne Harwood’s words, "Chilean art at ESCALA is very important in that it shows the wide range of practices in Chile and Latin America as a whole. Of all our Chilean artwork, Cecilia’s sketches make direct references to the politics of the coup d’état in 1973 and its national and international impact, which is the subject of research at the University of Essex. Created in England during her time in exile, palabrarma (1974) and eman si pasión/ parti si passion (1974) were born of Cecilia Vicuña’s recurrent practice of breaking up words and then joining them together as part of a poetic exercise. They both refer to the artist’s relationship with London, where she co-founded Artists for Democracy, an international collective that openly denounced third-world dictatorships and held a well-known exhibition devoted to Chile at the Royal College of Art in London in 1974. In the same way her work speaks of her relationship with England and Chile and is showcased through its permanent display in a British university, the drawings provide a historical point of view that links the past to the present. Forty years after the coup, Chile is questioning not just its political and economic model for giving rise to sharp social inequality, but also the legitimacy of the democracy established in 1990, given that the Chilean constitution was drafted during the dictatorship and is therefore, seen by many, as an illegitimate document. The controversy in Chile surrounding its constitution and the demands of Chilean social movements (the main one seeking to establish a free education system demanded by the student movement of 2011) have set an unheard-of political precedent in Chile that is drawing up the main axis of the platform of what will probably be the next government.